He’s awesome at getting injured. Benny seems to find new and exciting ways to injure himself all the time. Sometimes (hint: Wimbledon 2009) he crashes into walls. Sometimes (hint: the 2010 US Open) he vomits and his wrist explodes all in the same match. Sometimes (hint: Monte Carlo this year) while playing well against Andy Murray and at a career high ranking, he falls and hurts his elbow and ankle all at once. He’s also really, really awesome at hugging. But there are other things that Benny is not awesome at. He’s not awesome at rap. And he’s not awesome at winning titles. The Frenchmen, who has a career high ranking of No. 26 in the world, has never won an ATP title. He’s the highest ranked player on the ATP tour without a title, and has the distinction among active players of having the worst record in ATP Finals. At thirty years old he’s now been on the ATP World Tour for twelve years. He’s won six doubles titles, made seven singles finals, and won a bronze medal in doubles. He has over 5 million dollars in career earnings. He has career wins over Roger Federer, David Ferrer, and Jo Wilfried Tsonga. So why doesn’t he have a title? Is it mental? Is it bad luck? Is it lack of ability? Why hasn’t he been able to put it all together when it matters the most? *****To get a better idea of why Julien Benneteau doesn’t have a title, I think we need to look back at his seven finalist appearances. What happened? Was Benny the favorite? NO. Circumstances: In his first ATP Final, Benny (No. 65) played countryman Gilles Simon (No. 36) in the small clay-court event in Casablanca. This was right before Simon’s magical summer, where he beat Fed and climbed to the top 10. In fact, Simon didn’t plan on playing Casablanca, so he had to go through Qualifying rounds while Benny was the No. 5 seed. In the final Benny started out well–he broke Gilles early in the first set to take a 3-2 lead– but then he pretty much completely fell apart. Why he lost: He was lonely! Benny probably lost because Simon is a better player than he is. However, Benny told reporters after the match that he lost because he was lonely since his coach couldn’t be there that week. Seriously. He did. Circumstances: Benny’s 2nd career final came later that October on indoor carpet (RIP) against Soderling (WE MISS YOU). He was ranked 56 at the time, and knocked out Robredo, Clement, and Tsonga on his way to the final. In 2008, that was a very impressive run. Benny fought hard in the final, but was was broken four times by Soderling (No. 27), and was unable to capitalize on any momentum. After he fought from a break down in the second set to win the tiebreak, he immediately lost the next five games in the third set. Was Benny the favorite? YES. Circumstances: This entire tournament was just a mess. Benny played Qualies, even though he was ranked No. 45, because he wanted extra match play before the French Open, so he entered the tournament at the last minute. Then he lost in the final rounds of Qualies to Robin Vik, but got into the Main Draw as a Lucky Loser. During the tournament he defeated such household names as Dudi Sela, Nicolas Massu, Daniel Koeller, and Oscar Hernandez to make the final. He then took the first set. Then he lost in 3 hours and 10 minutes. Why he lost: He’s impatient. All GGL had to do was keep the ball in play and force Benny to make mistakes. Eventually he did. To add insult to injury: This was GGL’s first title! “I am so happy. It was incredible to reach my first final, and now I’ve won it,” he said after the match. Circumstances: Coming into the final, Benny was ranked No. 39 while his best friend Mika was No. 79. Benny had the very hard road to the final, upsetting Monfils AND Tsonga. But once he got there he just got out-classed by Llodra, failing to even generate a break-point. Circumstances: This was the most improbable of all of Benny’s runs to the finals. He came into the tournament ranked 113, still on the comeback trail after a wrist injury kept him off of the tour for about six months. He made it through qualies, and then scraped his way through round-by-round. In fact, he upset Andreev, Stakhovsky, and Haase ALL in third-set tiebreaks. Only Benny. In the final he came out playing superbly, breaking Isner at 4-4 in the 1st set to take the lead. But when he was broken at 3-4 in the 2nd set, he never fully recovered. After the match he sobbed uncontrollably on court. Circumstances: Benny (No. 49) started 2012 with a great run in Sydney, upsetting Baghdatis along the way, and seemed poised to finally capture that elusive title. Going into the final he hadn’t dropped a set all tournament! Jarkko was a qualifier in the tournament, and ranked No. 77. This would be it, right? Of course not. The rain delayed the final for an entire day, giving Benny way too much time to think about this. Once again Benny started out the match well by breaking Jarkko, but he fell apart after that. Why he lost: Because Jarkko is Benny’s nemesis. Benny has a 0-5 record against Jarkko Nieminen. Just think about that for a second. Wait, on second though, don’t. Stop thinking. To add insult to injury: Jarkko broke a six year title drought! Benny’s 30 year title drought remained intact. Circumstances: Benny (No. 34) was a surprise finalist in Kuala Lumpur. In the semifinals he crushed David Ferrer in straight sets. Though Pico (No. 11) is ranked ahead of Benny, Benny considered his chances “50-50” going in…which seems rather fair. The match itself was DRAMATIC. Benny saved six set points in the first set but still lost 5-7 in EIGHTY-ONE MINUTES. He took the 2nd set 6-4, but was broken early in the third set. He saved a MP but just couldn’t hold off the ever-consistent Pico. Why he lost: BECAUSE WHY NOT? But seriously, Pico was just a touch better than Benny on this day. Also, Benny was slightly broken. He got treatment for his right leg during the match and his right forearm was taped heavily. To add insult to injury: This was Pico’s FOURTH title of the year Couldn’t he have spared just one? *****So there we have it. 7 chances at a title. Zero wins. What did we learn from all of that? Well, first of all, it’s not about lack of fight. Four of his finals went to three sets. It’s also not about a lack of ability. In most cases he upset much tougher opponents in his route to the final than he faced in the final. Sure there were excuses– better opponents, injury, exhaustion– but most of it seemed to come back a lack of belief. This, in brief, describes what it takes to win at the French Open — defensive players who are willing to grind out long matches tend to prevail. And “tenacious” is an adjective rarely ascribed to French players of this or any generation. “The problem with the French players, generally, is that they are good players, very gifted, but not fighters,” Philippe Bouin said. 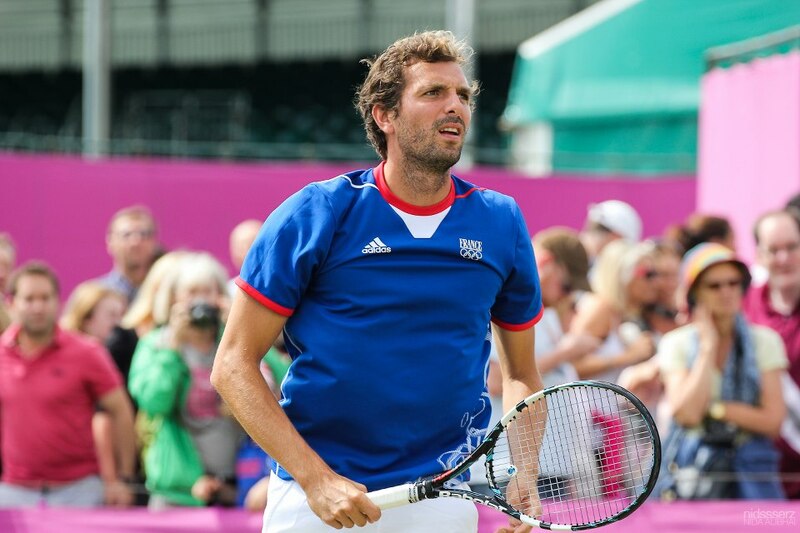 Nobody expects Benneteau to win the French Open, of course. But should he be able to win a 250 level event at least? Absolutely. While I know that Benny wants to win a title more than anything (he told me so when I talked to him at the Winston Salem Open in 2011), I have to wonder if he really has the belief. I think a lot of that comes from the French mentality discussed in the Grantland article, but part of it is also because of the arc of his career, and where he fits into French narratives. Benny was a late bloomer, not even cracking the top 50 until he was 24, so in his formative years he was often in the shadows of his peers such as Clement, Mathieu, and Llodra. By the time he started establishing himself at the late stages of tournaments, another group of Frenchmen had stolen the spotlight. He’ll never have the expectations or the pressure of Simon, Gasquet, Monfils, or Tsonga. But part of expectations is confidence and encouragement, and by falling so far under the radar he has missed a lot of that. Though he’s become a part of the French conversation lately (he finally joined the Davis Cup team in 2010 at the age of 28), if he fails to win a title in his career there will be no national day of mourning. There won’t even be that much pity, or sadness, or acknowledgement at all. Luckily the hard-core fans of the sport who have embraced Benneteau throughout the years know that his contributions to tennis can’t be measured in wins or titles. By wearing his heart on his sleeve and often leaving his composure at home, he has become a part of tennis lore. He talks (and sometimes yells) at the ball kids in French, even when he’s in America. He chases squirrels during his matches, because of course squirrels come on court during Benny matches. He has 57 shot rallies with Andy Murray for no reason. He was happier than anyone I have ever seen in my life when he upset Roger Federerin the Paris Masters in 2009. And yes, sometimes he has inappropriate visitors during Grand Slam Competition. That’s just Benny. Albert Montanes has five titles. Sergiy Stakhovsky has four. Steve Darcis has two. Philip Petzchner, Rajeev Ram, Jeremy Chardy, and Martin Klizan all have one. 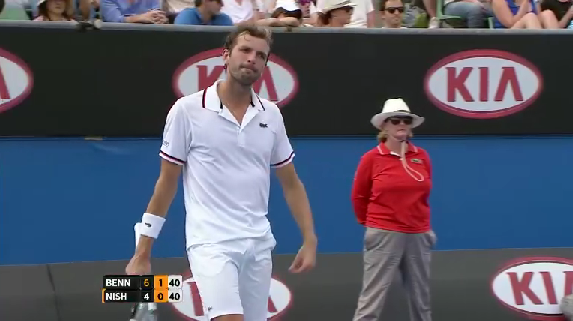 Julien Benneteau should REALLY have a Singles title on his resume. Unfortunately, should doesn’t get you anywhere in tennis. I certainly hope that before his career is over he is able to lift a trophy. But if he doesn’t, he should be proud that he’s still made quite the impact. Great article, Lindsay! I’ve always felt a bit bad for Benny, and it’s nice to see somebody else noticing his (unfortunate) distinction. I know that Benneteau has more match wins than any other active player without a title, and I believe that he may have more match wins than any player ever who hasn’t won a title. I always end up rooting for him as a result. He really deserves to finish his career with a title! Thanks Matthew! It certainly is a rough position that he’s in, and it seems to just get worse. It was interesting to look back and see the opportunities he’s let slip by…the matches against Jarkko and GGL really stick out. Hopefully he can get one before his career is over.